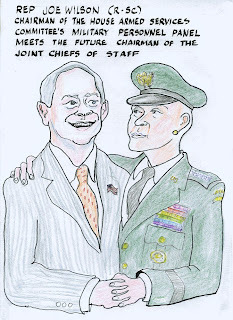 For two centuries homosexuals have been dismissed from the American Armed Services when their homosexual activities or proclivities came to light. Generals argued that the presence of such people in the barracks would be damaging to troop morale, and some have continued these arguments right up to the present. President Clinton, who strongly believed that one's sexual preferences were none of anybody else’s business, negotiated a compromise called Don’t Ask Don’t Tell, whereby if nobody said anything about their sexual preferences, the military wouldn’t say or do anything either. Under pressure by groups of homosexual soldiers wanting to participate in gay pride parades in uniform, President Obama camouflaged his catastrophic cave-in on tax cuts by trumpeting the successful repeal of D.A.D.T. only a day or two later. With government coffers ravaged by billions of dollars of new unfunded tax cuts, the last thing we need is to open up our military to a wider recruitment pool. I’m not sure anyone has refuted the generals’ arguments convincingly enough to overturn a policy which has stood since the dawn of the Republic, thus I propose a bold new option. Two centuries of defending our liberties and keeping us safe are enough. Heterosexuals, stop the macho posing and gun fixations! Take some time to smell the roses! Let our gay and lesbian brothers and sisters have a chance to defend the country, unfettered by concerns about morale in the showers. They’ve been deprived of their chance to become heroes for too long. We currently have about 1.4 million men and women serving in the armed forces of a country with a population around 307 million (adjusted to 276 million for a partial exclusion of gays to arrive at an effective recruiting base.) This gives us a ratio of active duty military personnel per 1000 citizens of about 4.56, although other published statistics indicate a figure of 5.1. Assuming a homosexual rate of 15% in the population at large*, we have a potential recruiting base of about 46,000,000, which, applying the current ratio of military to general population, would yield a totally gay military of between 210,000 and 235,000. This may seem a little small but our weapons are more advanced and our armed forces would still be nearly as large as the active duty forces of France, Germany and the UK, about the same as Japan, and significantly larger than those of Italy or Greece. All of those countries, just like the US, appear to be less vulnerable to military invasion than to threats from within (primarily from banksters and brain-dead politicians). The GOP is now clamoring for budget reductions but none of the deficit hawks has come up with a plan this efficacious. Upon redimensioning our military resources, we could no longer indefinitely sustain wars started to pre-empt energy supplies or assuage presidential neuroses. Our Army, Marines, Navy, Coast Guard and Air Force couldn’t possibly utilize the vast array of weapons currently under development so we’d have to cut back these programs or just continue selling them to other warlike regimes around the world. For better or worse we could no longer occupy 135 of the world’s 192 countries. The merger of gay pride with our traditional militaristic fervor will produce an awesome fighting force, with new elite units such as the Stonewall Regiment being formed. Such mergers and subsequent downsizing of the workforce are in the mainstream of the American values we seek to defend. To be sure, implementation of the new policy would involve some inconvenience. The sudden addition of hundreds of thousands battle-hardened veterans to the ranks of the unemployed could result in some collateral damage, but we’re a resilient people. The strong would survive. Less onerous side effects would include the cancellation of current TV shows such as Army Wives and their immediate transfer into syndication to take their place in history alongside Happy Days. This being the Age of Obama, we’re not unmindful of the need to have a fall back position ready at the time of the presentation of any proposal. We’re ready with an effective compromise right now. While it would limit the inherent savings of the scheme, it could none the less appeal to the corporate funded Members of Congress of both parties. If our proposal (which unlike some of theirs, doesn’t advocate killing or torturing anyone) should be deemed too rash by our elected leaders, we can apply our proposal to only one of the five service branches. Given that it has already been infiltrated and taken over by radical, religious fundamentalists, hell-bent on subverting the Constitution and installing a theocracy, the Air Force would be the clear choice to apply a thorough house cleaning. The instant redundancy of all our Air Force personnel would flood the market with pilots, thus destroying the airline pilots’ union and restoring our airlines to profitability. How many Senators could say no to that? While deficit reduction would be the principle beneficiary of the new policy, there would be secondary benefits. 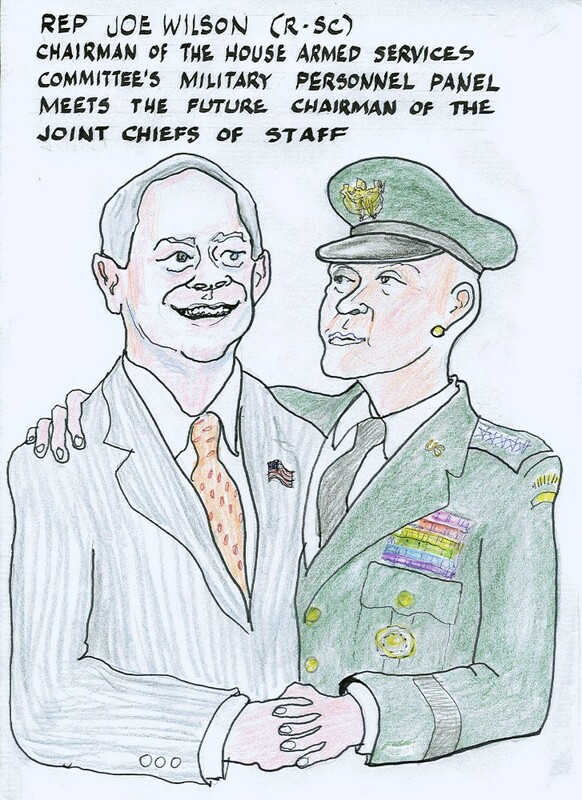 For example, it would force some of the more homophobic members of Congress, Senators such as Cornyn and Imhofe, and Representatives like Pete Sessions, who also happen to be among the most fierce proponents of war to resolve all foreign policy issues, to reexamine their priorities and values. Many of these Senators and Congressmen are absolute believers in American exceptionalism, seeing the country as the natural (and sometimes God’s chosen) leader of the world. It’s time for American ingenuity to take another extraordinary step to keep America solvent and to keep its boot off the necks of the unexceptional people of the world. * The 15% estimate is higher than most published figures, except in San Francisco, but it’s close to that in Boston, Seattle, Atlanta and Minneapolis. However, if the actual percentage is lower, the budgetary benefits and demilitarization would only improve. If ultimately, the recruiting base proved too small for our national defense, the Air Force conversion would remain a viable policy option.